Tesla unveiled its crossover SUV electric vehicle on Thursday night but Wall Street was largely unimpressed by it and received it with little fanfare. The shares dropped more 4.5 percent in trading Friday. “Overall, we found the event somewhat underwhelming with no major surprises,” Deutsche Bank’s Emmanuel Rosner said in a note. The Model Y will use about 75 percent of the same parts as Tesla’s low-cost Model 3, CEO Elon Musk said. 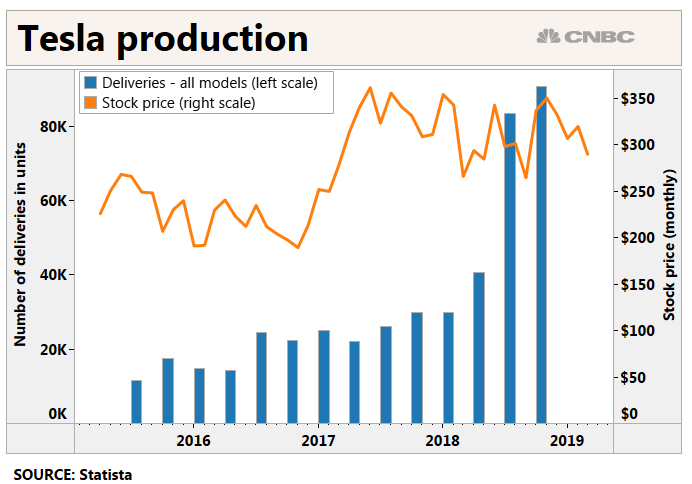 That makes the Model Y “likely to cannibalize the Model 3,” Morgan Stanley analyst Adam Jonas said. Cowen analyst Jeffrey Osborne also said the “Model Y reveal underwhelmed us,” especially since “the night held no surprises.” Osborne said investors were looking for a refresh to the Model S and Model X lines, new software or even details on how Tesla’s first quarter is going.